18M Chest 20" Waist 19 ½"
2T Chest 21" Waist 20"
3T Chest 22" Waist 20 ½"
4 Chest 23" Waist 21 ½"
5 Chest 24" Waist 22"
6 Chest 25" Waist 22 ½"
7 Chest 26" Waist 23"
8 Chest 27" Waist 23 ½"
10 Waist 28 ½" Waist 24 ½"
12 Chest 30" Waist 25 ½"
14 Chest 32" Waist 26 ½"
16 Chest 34" Waist 27 ½"
18 Chest 36" Waist 30"
20 Chest 38" Waist 32 ½"
Cute cheerleading outfit features Two Tone Wide Band Shell & Flat Front Skort. Made by Cheer Kids from Motionwear. Ships in 2-3 weeks - may take a bit longer in late summer/fall and during holidays. Minimum order is 6 outfits. If you need more than 100, email sales@acdsports.com for special league pricing. 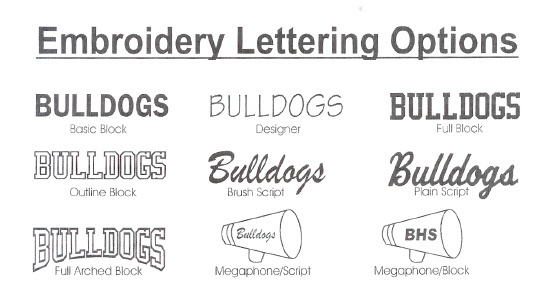 These outfits can be custom made in larger sizes for an extra $15 & an additional 2-3 weeks production time. Contact us for details. please check out our In Stock Cheer Uniform section. Embroidery on front is included in price! Use the same method to measure all girls. 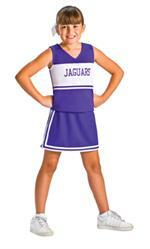 Have the girls wear undergarments similar to those they will be wearing under the uniform. If a shirt or tights are to be worn under the uniform, be sure to allow for that. Measure all girls at the same time if possible. Use a fabric tape measure if possible. Make sure the tape measure is held snugly, and firmly (not tightly) against the body. When measuring circumference measurements, make sure the tape measure is parallel with the floor. If a girl is out of proportion with standard measurements, order a size large enough to be altered to fit. If chest measurement is close, but waist and/or hips are smaller, size by the chest and alter the waist. If chest measurement is close, but waist and/or hips are larger, size by the hips and alter the chest and/or waist. Jumpers are sized for snug fit. Size up 1 size for normal fit. 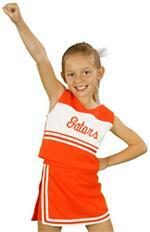 CheerKids uniforms are designed for girls who have not yet started to mature. There are no darts in larger sizes.